God is only drawing those that have been predestinated to be called now and they are called for some special job. Then the church has been called for a special job. What is it? Most people in that church don't know it. They don't know what they are called for. They think they are called to get, get, get salvation. Satan is the great getter. You were called to give, give. That's God's way. That's the way of God's law. Love is giving, outgoing love. Away from self. Why a Church, What is the Mission? Why did Jesus Christ raise up the church? What do we need a church for? And why didn't He just save individuals alone by themselves? Why do we need a church with an organization? What is the church for? What is its purpose? The real purpose and function of the church simply has not been understood. And very few of our own people in that church even understand it. Jesus was crucified, He was resurrected and He was three days and three nights in the tomb. And then after His resurrection He was with His disciples for forty days. Well, Now in Acts the first chapter and the third verse (Acts 1:2-3), "...onto the apostles whom He had chosen: To whom also He Jesus, showed Himself alive after His passion by many infallible proofs, being seen of then forty days and speaking of the things pertaining to the Kingdom of God." He taught the Kingdom of God. And after in, that forty days after His resurrection He still was teaching them the Kingdom of God. Jesus had gone about all the cities and villages preaching in the synagogues teaching the Kingdom of God, in other words announcing its going to come. Whether you like it or whether you don't, you don't have to agree with it. You're not; it doesn't require a vote or anything of the kind. Well then came what we call the day of Pentecost and originally it was called The Day of First Fruits because it is the first harvest and its intended to show us that God isn't saving everybody now. Only those He's calling to a special duty to a special mission and if He calls you now it isn't to get saved to get your salvation, it's to give of something for Him. I wonder how many of you believe that. You've been called to a job. You've been called to a mission. Now then I want to show you what that mission is. You come over here to the fourth chapter (Acts 4:1-3), "...as they spake unto the people, the priests and the captains of the temple, and the Sadducees came upon us", Peter and John, "Being grieved that they taught the people and they preached through Jesus the resurrection from the dead. And they laid hands on them and put them in the hold or the prison until the next day..."
Now going on to the eighteenth verse (Acts 4:18), "And the next morning now they called them," Peter and John, "and commanded them not to speak at all, nor to teach in the name of Jesus." They were called before the priests and the dignitaries. And that was a freighting thing. They spent the night in jail. Now the apostles, the word apostle means "one sent forth," the apostles are the one Christ taught the message and sent forth with the message. He didn't call the ones He added to the church to go out with the message. I'm gonna prove that to you in just a few minutes. That He called them to send back the apostles. Now then I want you to notice what they did. It says then in (verse 21 and 22), "and when they had further threatened Peter and John they let them go..."
Now they were a little bit frightened, their human, and they had been to some extent intimidated and the apostles what did they do. They went to the members that God had added to the church. Notice in the fourth chapter now and uh verse 23 (Acts 4:23-24), "And being let go, they went to their own company," that is in the church "And reported all the things the priests and the elders said to them. And when they heard it, they lifted up their voice unto God with one accord..." Notice they were with one accord there weren't any division between them. "...and said, Lord, thou art God, which has made heaven, and earth, and the sea..." and they asked God to send the Holy Spirit and to strengthen these men and to encourage them that they could go on preaching the word. (Verse 31; Acts 4:31) "And when they had prayed, the place was shaken where they were assembled together; and they were all filled with the Holy Ghost [Spirit], and they spake the word of God with boldness." They went right on doing it. What Does the Church Do, and What is It's Function? Now then I'm trying to show you what the church did do, and what was the function of the church back in those days. You read right over this many time, but you never got the point, probably. Now then, if you did I'm glad. Lay members did not go forth with the gospel. It is the word apostle that means, "Go forth or one sent forth". And it is the apostles and later a few evangelists went out with the gospel, but not the lay members. But the members backed up the apostles with their prayers, with their encouragement and with their tithes and offerings to support the work that it could go on. Now I want you to notice further. Savage persecution had set in the eighth chapter of Acts in verse 1 (Acts 8:1), "...Saul was consenting unto Stephens's death. And at that time there was a great persecution against the church which was in Jerusalem..." Now this came to about 33 A.D. The church was raised up and born in 31 A.D. This was then about two years "...and they were all scattered abroad throughout the region of Judea and Samaria except the apostles." A terrible persecution came in. Now just a little bit later (Acts 12:5), James was martyred and "Peter was taken once again put in prison..." but, now get this. What is the purpose of the church now? Not a lot of scattered individuals out here, but a church organized and together in harmony. (Acts 12:5) "Peter therefore was kept in prison, but prayer was made without ceasing of the church unto God for him." Now then an angel came and released Peter. He was bound with chains hand and foot and released him and the doors opened and the angel just took him right out of there and Peter fled on over to Caesarea. And the next morning the authorities couldn't find Peter so they just had to drop it. Now then I'd like to have you notice the great commission. You notice Matthew 28, I want read this to you in the revised standard translation too, but it says here in the sixteenth verse (Matt. 28:16-18). "Then the eleven disciples went away into Galilee, unto a mountain where Jesus had appointed them. And when they saw Jesus, they worshipped Him; but some doubted. And Jesus came and spake unto them..." unto whom, the eleven disciples. Judas already had left and they had not yet appointed Matthias to take his place at that time. (Matt. 28:18-19) "All power is given unto me in heaven and in earth. Go ye therefore, and here it says, and teach all nations..."
Now some construe that to mean go out and talk everybody into being converted. It doesn't say anything to the kind, it doesn't mean it. Teach, to get, to understand that, you need to get it as it is in the revised standard translation (Matt. 28:19 RSV). "Go therefore and make disciples of all nations..." Make disciples, now a disciple is a student or a learner, one that is listening, but not necessarily agreeing, but being taught. In the, in the King James, its go and teach in all nations, it doesn't mean to teach everybody. Did they go and teach everybody in China, Japan and India, of course not. It hasn't been done to this day, and that isn't what Christ commissioned them to do. (Matt. 28:19 RSV) "...baptizing them...", now who would they baptize? The only ones that could believe were the ones God had called, Jesus said so. No man can come to Me except the Father draw him. No man could come to Him otherwise. (Matt. 28:19-20 RSV) "...therefore make disciples of all nations baptizing them in the Father, the Son and the Holy Spirit, Teaching them to observe all that I have commanded you..."
It's just teaching, but not talking them into anything. And I think we have misunderstood so much of that. Now then you come to Mark's version of the great commission and in Mark 16 and it's in verse 15 (Mark 16:15) will actually beginning, oh back here about a, what is it, verse 9 or 10 and in most translations it is not even given and they say that most of the rest of it was added was not in the older manuscripts at all and probably was added by some uninspired editor later. However whatever it is whether it is or not inspired, in the fifteenth verse (15 verse) "Jesus said unto them, Go ye unto all the world and preacher the gospel to every creature." That is to preach the gospel, and if you read it in the revised standard, in all nations. Not to every individual on earth. You know that that would be impossible and isn't intended, but go and teach in all nations, but it is to get it out. Now for our time in Matthew 24 and verse fourteen (Matt. 24:14) is the prophecy of the great commission being fulfilled in our time. "And this gospel of the kingdom", not some other gospel, "shall be preached in all the world for a witness unto all nations;" Not in all nations but "in the world for a witness unto all nations; and then shall the end of this age come." Now it is being proclaimed and I have had a little something to do with it myself and that's one reason that Satan is so angry at this church and trying to do anything he could to destroy it because this is the only church doing that and Satan knows that very, very well. Free booklet offer: Why were you BORN? Now the purpose and function of the church then number one, to back up the apostles as they, as their part, that is the churches part of backing the apostles in the great commission, and the great commission was given to the apostles was not given to the laity of the church at all. I just read that to you and whether you take Mark's version or Matthew's, Jesus was speaking only to the apostles and not to the church as a whole. But the church as a whole was to back them up and I have shown you the two cases where their prayers enabled the apostles to continue right on and that was as Gods means. God gave the church now this duty of backing the apostles as Gods means of giving, giving help, to develop the character so that they could overcome Satan. Develop this character to get into the kingdom of God and qualify to sit with Him on His throne and to rule. God has given us the way to develop that character and the way is in a body and to get into that body which is an organized spiritual organism and to have your part in it. Now remember that Gods church is still within that six thousand years and all the rest of the world is cut off from God. We're in the world, but not of it, but we have come out of the world and we must pull together. God gave His government to the angels when they were on earth because He wanted them to pull together and work together to get something done and you can't do it if you are all pulling apart in different ways. So that's why He put His government over them. And His government is from the top down. So He put His government in the church. God's government means government from the top down, from God the Father on through Christ on through the apostle and it was through the apostles in every case in your New Testament. Then there were in the church were Evangelists, Elders and Pastors and other teachers of course in the church. The church is not a worldly organization. Let me repeat that, now listen, the church is not a worldly organization. It is not a carnal minded organization, it is a spiritual minded, spiritual organism, but it is organized. Even though it is a spiritual organism it is organized. Now then, if you are building a building, and the church is compared to a building and you have to have a foundation. What is the foundation? I want you to notice now in Ephesians the second chapter and verse nineteen (Eph. 2:19-21), "Now therefore you are no more strangers and foreigners, but fellow citizens with the saints and of the household of God." The household of God is the family of God. We're begotten to be born of God at the resurrection. "And are built upon the foundation." Now what is the foundation of the church? Here it is, "the foundation of the apostles," that's the apostles of the New Testament and the prophets, the prophets of the Old Testament whose prophecies were for us today, "Jesus Christ himself being the chief cornerstone. In whom all the buildings fitly framed together..." together not separated. It's got to be organized. It's got to be together. "...growth unto a Holy temple in the Lord." and now notice here in I Corinthians 12 verse 11 (I Cor. 12:11-13), "But all of these worketh that one in the selfsame spirit dividing to every man severally as he will." That is to which job or what function you have in the church. We all don't do the same thing. "For as the body is one..." and there is only one church. There are not two churches. There are not three churches. There are not hundreds of churches. They are not Gods churches. Satan has this world deceived and there are many that are Satan's churches, but there is only one church of God, "But all these see of the selfsame Spirit, dividing to every man severally as He will." God decides, God has decided who's going to be an apostle, who's going to be this that and the other thing. Christ said to His disciples, you didn't choose me I chose you. I didn't choose God, the last thing in the world I wanted to do was what He called me to do, but He chose and He saw to it that I would do it. "For as the body is one and hath many members and all the members of that one body being many are one body..." Not a lot of different churches. "For by one Spirit are we all baptized into the one body..." Only one church and Christ is the head of that church and it's that authority from God the Father through Christ through the apostle that He chose and ordained. And now we come on down to verse 28 (I Cor. 12:28); "And God has set some in the church, first apostles..." and their next under Christ and all of the doctrine and all of the teaching that they had in the church came from God through Christ through the apostles. Now let me explain right here that in the church in the first century, there were also prophets. The Bible had not been all written yet, in fact most of the New Testament had not been written yet. And so when God had something new to reveal He would reveal it to a prophet, but the prophet went immediately to the apostle and it was the apostle who acted on it not the prophet. Now there are no prophets in the church today because the Bible is complete. No one has ever come to me telling that God had said this and sent the message through him to me. Oh I have had people come to me and tell me they were Elijah or they were something like that, but I will tell you right now, I didn't believe them. But God has set some in the church first apostles, God set them there. Now they didn't appoint themselves, if God doesn't set them there, you are either in the church or you're out of the church. If you are out of the church you are out of Christ, you're out of God and you are not going to into this wedding and you're not going to marry Christ. It's the church of God that is going to be turned into the kingdom of God and those outside are not going to be. "God has set some in the church, first apostles secondarily prophets", and I say the prophets in the first century, there aren't any today, "thirdly teachers, after that miracles, and then gifts of healing, helps government and diversities of tongues." but we all are not prophets and we are not all this and not all that. He goes on to show that every man that God divides it severally His will to each one. Free booklet offer: Just what do you mean... CONVERSION? Now sometimes there is an individual that says well I want to just simply be alone, a loner, I'm just gonna get my own salvation. Alright I answer your only getting side and you won't get it, and God's way is to give. 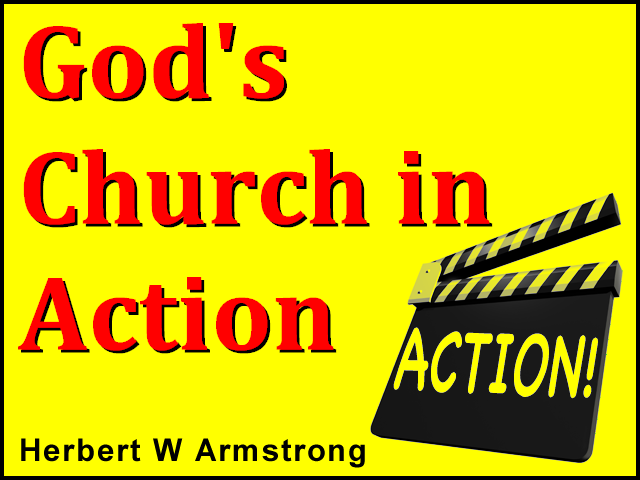 God's way in the church, He's given the church something to give of their tithes and offerings, of their prayers, of their encouragement to back up the apostle. Let me tell ya, God has made me an apostle. He didn't speak to me and tell me way back there fifty years ago that He was gonna make me an apostle. Some have said, how do you know. Well I'll tell you how I know. John the Baptist sent some messengers over to Jesus to ask Him if He really was the promised Messiah. Jesus didn't just say yes or no. I don't have to say yes or no. Jesus said you go tell John what you see being done. Go show him the fruits that are actually happening, that will tell him whether I am the right one or not. I look back at the fruits of fifty years brethren and God says He has made me His apostle and that is pretty well recognized all through the church and it has not been disputed to my knowledge anywhere. Now then if you will notice chapter four (Eph. 4:11); "And He gave some apostles, some prophets and some evangelists and some pastors and teachers." Now we have used that in the founding of God's church, first apostles of which God has only put in one today and as I say there are no prophets, but then we have evangelists, quite a number of them. Next come pastors and we have still a greater number of those and then teachers, all of whom are elders. Now why did God set apostles, evangelists and pastors and others into the church? Why? Notice it back here in Ephesians four and verses twelve and thirteen (Eph. 4:12-13), He put them in the church; "For the perfecting of the saints, for the work of the ministry", getting the gospel out to the world, "for the edifying of the body of Christ: Till we all come to the unity of the faith..."
You can't do that alone by yourself, you just can't. You're either in the church or you're out of the church and the time has come to know that one way or the other. "We all come to the unity of the faith, and of the knowledge of the Son of God, unto the perfect man..." and this building that is on this foundation of Christ and the apostles and so on. Someone might say well cannot the self or some other leader teach us. Can't we edify our self, the answer is: how does God infuse His truth into the church and into its members, through some outsiders. No it came through the apostles and that's the way it is today. Now then, God has given us the way and it's the way of giving and He has given us our part within the church. And Christ said that He is the door and if you try and climb up some other way you are a thief and a robber. Well what about trying to get your salvation some other way brethren? We need to think about that. Who tries to climb up some other way will be cut off from the teaching. (I Corinthians 1:10) "that we all speak the same thing", but it's the same thing that God infuses in the church through the apostle. Now otherwise one speaks on way and another, another and that's what they were doing. Let me give you an example, here we have a team of horses, and as a man, I might just say that this is like a parable. A man is driving a team of horses and one of the horses will go the way he wants it, but the other one will only go the way he wants it about eighty percent of the time and he keeps hee-hawing off the wrong way all the time and those horses are not going to get the man to his destination. They got to pull together and go the way their intended to go, the driver is Christ. He is the one who is driving and is the real foundation. Now in closing I just want to say again this book, booklet I want to mention again, "Just What Do You Mean...Conversion?" There's no booklet like this. Very few people understand what conversion is and I'll tell you it's about ninety-nine and forty-four one hundredths percent impure and misleading today of the teaching in the world. If you want the truth you don't have to pay for it. This booklet is free. "Just What Do You Mean...Conversion?" and the other one is "Just What Do You Mean... Born Again?" What is it to be born again? You know even heads of government sometimes don't know what it means to be born again and you need to know what it really means. This booklet will make it plain and there is no, absolutely no refutation of it one way or the other it's the plain word of God, very plain, very simple. So now I will say, I've about talked myself out and I've about worn you out I'm afraid. So I will say good-bye for now, until the next time this is Herbert W Armstrong saying good-bye friends.